By LUDWIG VON KOOPA - His game and his Amiibo! 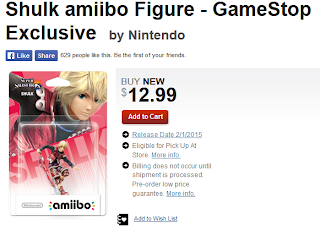 Now we have learned from Nintendo that Shulk's Amiibo will also be exclusive to GameStop. GameStop is saying it's an exclusive in the same wording as before! We'll wait for Pre-Owned Shulk figures to be $22.99. Actually, it's not that ridiculous that Shulk's Amiibo, or anyone else's, might increase in value if it's pre-owned. After all, he will be trained already, and depending on the owner, he might be capable of things you could never imagine. Folks are already predicting that Amiibos owned by Super Smash Bros. series professional players will be quite high in value, since the Amiibo will learn its tricks off its owner. Certainly worth a lot more than what that Flare Blitz-spamming guy online's Amiibo will be worth. Does Shulk's vision involve a GameStop that is flailing in the face of surging digital purchases instead of brick-and-mortar? Or does Shulk see a GameStop that is able to adapt to that trend and then has a resurgence in importance? Which future would benefit Shulk more? After all, he wants to be successful, right? (Or maybe he doesn't. I don't know his motive!) Well, if GameStop fails, how can it possibly benefit Shulk for his games and himself to be stuck on a sinking ship? And if GameStop succeeds, how does it benefit Shulk to only have his games and himself at GameStop when maximising his exposure involves being everywhere? And the more exposure, the more sales. OR Shulk wants to preside over the fall of GameStop. Shulk and Xenoblade Chronicles might be sabotaging GameStop from the inside. Ludwig wishes he had more knowledge of Xenoblade Chronicles so this article could be more coherent. If you know more about Shulk than Ludwig does (he only sees Shulk as an anti-Koopa terrorist), please offer your insights in the comments section! Along with having a dubious relationship with GameStop, Shulk is also a Pokémon. If the series remained a GameStop exclusive forever, Rawk probably wouldn't be a fan of it.